iOS 4 has arrived! Much to love. Apple’s latest operating system upgrade for the iPhone, iOS 4, was released Monday, packed with over 100 new features including multitasking and folders. 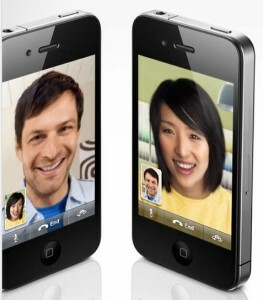 iOS 4 is compatible with iPhone 4, iPhone 3GS and iPhone 3G, as well as recent generation iPod touch. Multitasking is only available with iPhone 4 and iPhone 3GS. iOS 4 also comes preinstalled on the new, $99, 8GB iPhone 3GS, as well as the next-generation iPhone 4, set for release this Thursday. Multitasking: Now you can run your favorite third-party apps —- and switch between them instantly —- without slowing down the performance of the foreground app or draining the battery unnecessarily. Folders: Organize apps into folders with drag-and-drop simplicity. Get faster access to your favorites and browse and manage up to 2160 apps. Even better Mail: See messages from all your accounts in a unified inbox, organize messages by threads, open attachments in third-party apps, and more. iBooks: More than a great ebook reader, iBooks is also an amazing place to browse and shop for books, day or night.Create playlists: Create custom playlists right on your iPhone. 5x digital zoom: Get closer to your subjects by zooming in up to 5x. Tap to focus video: While shooting video, tap the display to choose where to focus. Faces and Places in Photos: View photos based on who’s in them and where they were taken. Home screen wallpaper: Change the background wallpaper on your Home screen. Gift apps: Send apps as gifts to your friends or family. Spell checking: A built-in spell checker works in Mail, Notes, and other apps. Wireless keyboard support: Pair a keyboard based on Bluetooth wireless technology with your iPhone. AT&T stopped accepting iPhone 4 preorders entirely, informing consumers that sales were temporarily suspended due to demand ten times higher than for the iPhone 3GS. Ok. Today was a big day in the World of Apple. 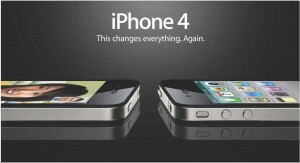 Apple introduced a new, super-slim iPhone 4 today, which Steve Jobs likened to a Leica camera in design and quality. A stainless steel band around the phone’s edge is both structural and part of the antenna. A new “retina” display packs in 326 pixels/inch, supposedly above a 300ppi resolution limit of the human eye at a distance of a foot. The 3.5-inch display offers 960×640-pixel resolution and uses IPS screen technology. 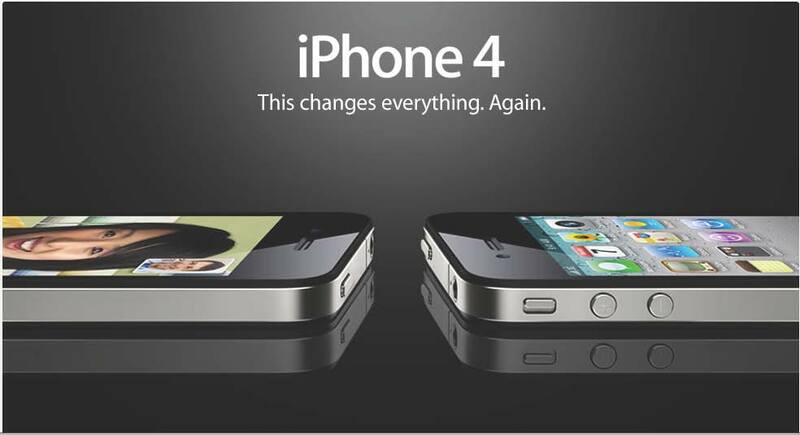 The iPhone 4’s other features include a bigger battery (and longer run time), Apple’s “A4” processor (used in the iPad), 32 GB of storage, dual microphones for noise suppression, plus a built-in, 3-axis gyroscope that will be supported by new CoreMotion programming interfaces. Facing competition from other smartphones, Apple has again upgraded the iPhone’s camera in the new model, switching to a “backside illuminated sensor” for improved low-light performance, while capturing 5 Mpixels (up from 3 Mpixels). There’s an LED flash, and you can tap to focus the lens. And the camera now captures HD video: 720p at 30fps. A $4.99 iMovie app lets you edit video right on the iPhone. Jobs demonstrated video conferencing via a second camera that faces the user. 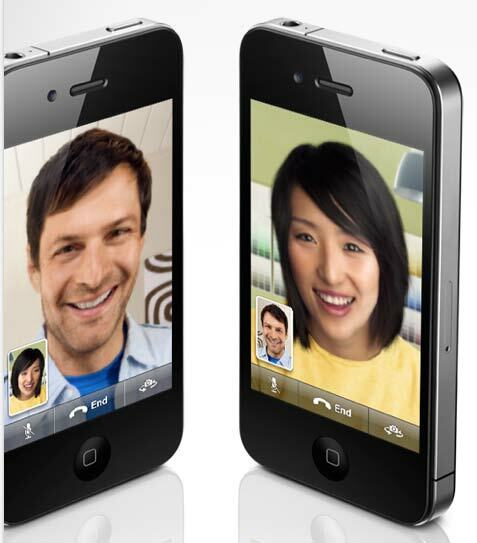 This “FaceTime” app uses WiFi only for now; it works iPhone 4-to-iPhone 4 without any special set-up tasks, according to Jobs.